Kodak was founded in 1884 by George Eastman and he put his company on the map in 1889 when he developed the Kodak camera which made photography a possibility for everyone. Since that moment, Kodak has had a reputation as one of the best in the photography and film industries. Kodak is the reason that we are able to carry cameras around in our purses or even have them on our phones. Today, Kodak continues to maintain their reputation for cutting edge photography technology. When Eastman started his company he built it on four basic principles: mass production at low cost, international distribution, extensive advertising, and a focus on the customer. He saw how important each of these principles was to the success of the others. As his company grew, Eastman added three more policies to the already existing principles: foster growth and development through continuing research, treat employees in a fair, self-respecting way, and reinvest profits to build and extend the business. These seven basic principles are still in place at Kodak today. 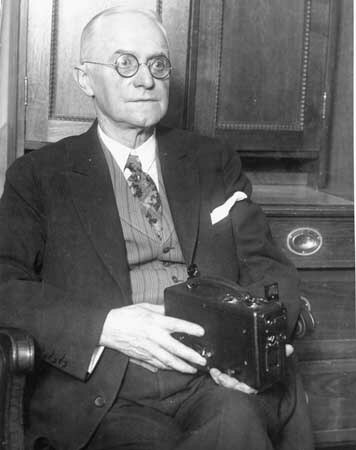 The history o f Kodak begins with one high school dropout, George Eastman. George Eastman grew up poor and at fourteen years old he decided to go to work and make money for himself. He began as an office boy for an insurance company and then worked as a clerk in a local bank. At the age of 24, Eastman was introduced to photography. After buying a “photographic outfit”, he became completely immersed in the art and science of photography. He started to read research about the latest photography in England and at night would do experiments at his mother’s house. By 1880, Eastman had developed a formula that would replace the traditional wet plates needed to take photos with dry plates and in that formula he saw the opportunity to grow. In April 1880, Eastman leased the third floor of a building in downtown Rochester, New York and he began to manufacture and sell his dry plates. As his business grew, Eastman continued to experiment. He developed a more sensitive film and also roll holder for the film. Although there were still some kinks in his new film, Eastman was changing the whole direction of the industry of amateur photography. In 1888, he continued to change photography when he made it possible for anyone to purchase and operate a handheld camera. Since that time Kodak has been striving to make photography convenient and accessible. For a full timeline of all of Kodak’s milestones, please visit click here. Kodak began as a company that targeted amateurs. George Eastman’s goal was to provide photography to the masses at a reasonable price. That is still a main goal of the corporation. One of their main target demographics are those people that do not necessarily know a whole lot about photography. They are selling to the grandma who needs a camera in order to take pictures of her grandson and the high school senior who needs a camera for prom night. Many of their cameras and video cameras are built to be appealing to someone who is not a photographer as a profession. However, as the company grew they started to target the professional photographer as well. Eastman’s policy of continuing research is aimed to keep Kodak at the top of their game. Kodak aims to be able to supply the world’s photographers and videographers with the latest technology that will make the photos and films the best out there. Kodak wants to be able to offer professionals the best technology while at the same time giving the amateur photographer accessibility. Out of Grunig and Hunt’s four models of public relations, I would say that Kodak uses the two-way symmetric model. The two-way symmetric model involves conducting research to determine the views of the consumer and then use that to build the objective. This model aligns directly with the principles that Eastman built his company on. He believed that continuing research would not only help the scientific aspect of the company but also help them better understand their consumer. An example of their continuing research is their Flickr page. On Flickr, Kodak encourages their customers to publish photos that they have taken with their Kodak cameras. The not only encourage the good photos, but also the bad ones. Although they hope to only have good photos produced, they use the bad ones to better understand what they need to do better. Then they take that information and are able to better communicate with their public what they are adjusting on their products so that the consumer will be more pleased. Like any corporation, Kodak has challenges to face on their way to success. A main challenge is the rapidly changing face of photography. It seems only a few short years ago that we were still using film cameras and now everything is digital and film is considered vintage. Kodak is continually attempting to keep up with the changing market and the demands of the consumer. It is not made any easier by the influence of foreign markets in America especially from the Asian companies. Over the last 10 years, the Asian photography market has blossomed. With the introduction of digital cameras, Kodak’s technological foundation has been pulled out from under them and they have been playing catch up with companies on the other side of the world. They have had to fight Asian companies like Fuji for the allegiance of the American customer. Also during the last five years, Kodak has struggled like most companies with the economic recession. Living in Rochester, which is still a large base for the corporation, it seems like every month there is an article about lay-offs at Kodak. Part of the reason is the economy and the need for the company to trim back on spending, but a large par is also the digital age. With the various advances in technology, Kodak has had to cut back on unnecessary spending and for many of their employees that includes them. This challenge is something that George Eastman himself would have taken personally. He strongly believed that a company was only as strong as its employees and he would not have seen the “trimming of the fat” as an appropriate way to treat his employees. Over the last century, Kodak has been honored several times for various contributions to both science, photography, and the community. However, trying to find out what those awards are can be kind of challenging. Part of the reason for that is because many of the awards they have received over the years are only of interest to those in the immediate profession. For example, many of the awards they have received in the last ten years have been to individual engineers and scientists that work for Kodak. Many of Kodak’s technological achievements in both photography and film have been recognized, but they have not been highly promoted to the general public. Instead, Kodak chooses to promote those awards and honors to other professionals in those specific industries. Kodak is all over the place in social media. They have various fan pages on Facebook, several different areas of the company to follow on Twitter, multiple blogs written by various people in the company, ways to share your Kodak pictures on Flickr, and a channel on YouTube. No matter which social media is your drug of choice, Kodak has most likely got you covered. On their different sites, they give followers the opportunity to be introduced exclusively to new products and the ability to give feedback on Kodak products. Just like the company’s products, there are some pages devoted more to the professional and others the amateur. The main benefit that Kodak gets from the use of their social media is the consumer feedback. Through especially their blogs and Facebook pages, they are able to hear what their customers have to say about their products. They can then take that information and apply it to the necessary areas of their corporation. That customer input is priceless to a company like Kodak. Another benefit for Kodak from social media is the free advertising. Through using YouTube and Flickr, potential customers can see what Kodak’s products are capable of through not just the eyes of the company, but other consumers who have bought and used the product. For more information on Kodak’s social media sites, please click here. To get to the online newsroom, you click the News and Media tab at the top of the About Kodak home screen. This tab will take you to the main hub of their online newsroom. Through this you can find news releases dating back four years and also find any international Kodak news. It is also how someone might find information on the release of new products and information on the company executives. Kodak’s online newsroom is incredibly well organized. Everything is easy to find and readily accessible. The ease at which it was for me to find any press release from the last four years really made me feel like that as a company Kodak wanted to make its business available for the general public. It is not designed simply for the public relations professional, but instead can be navigated by anyone who is looking for more information on the companies’ latest activity. Kodak has an entire page devoted to careers that are available at their various locations. Kodak is both a national and international company so their various communications departments are essential in maintaining open lines of communications between the company’s various hubs. So they are constantly looking for people with experience to build their communication’s departments. Also with their various social media outlets, they need people within their corporation who have a strong knowledge of how to best use the different kinds of social media. To look for a job at Kodak, please click here. In January 2009, Kodak announced that due to a massive fourth quarter loss of hundreds of millions of dollars that they would be slashing between 3,500 and 4,000 jobs. This came as a complete shock not only to the public but especially to the employees of Kodak. Kodak’s thousands of employees were sent into a tailspin and began panicking that they were about to lose their jobs. Kodak quite literally had hysteria on their hands as they were trying to desperately save themselves from a critical monetary lose. Kodak main plan for handling the crisis was to be completely upfront with their employees and the public. They were incredibly transparent about the reasons that they were having to lay-off so many people and what they planned to do for those that they were laying-off. They set up various programs for those that had lost their jobs in order to give them some sort of supplement pay for a period of time. They expressed their sadness over the mass firings and did their best to convey to the public that they were doing their best to make sure that it never happened again. Kodak is extremely involved in its surrounding communities. When George Eastman began to make money, he also started giving it away. He believed that it was incredibly important to give back to the community that helped build his company. In particular, he was fond of giving to the arts. In Rochester alone, Eastman built a theater and a music school. Kodak Theater is used by several of the local high schools who need a bigger auditorium to perform in and the Eastman Music School boasts some of the greatest talent in the Northeast and also provides scholarships to underprivileged students. Kodak also is heavily involved in diversity. They have been named as one of the most diverse companies in the nation for several years in a row. They work in the community to offer equal opportunities to people from all backgrounds. Each year Kodak sponsors various African American and Hispanic initiatives in order to education and encourages those from the African American and Hispanic communities. For example, in Rochester, during African American History Month Kodak sponsors the sixteen page spread in the local newspaper of where African Americans have come from. They also work heavily with the Boys and Girls Club of America. After researching Kodak, I have seen things that I like and would want in a company that I worked for. For one, I like the opportunities that they have in the communications world. They are constantly entering new areas of social media and need people that have grown up in that generation. There seems to be a lot of room in their company for the newly graduated student who would have a better knowledge of technologies available. Also, as Kodak is an international company, there would be opportunity to travel which I would love to do. My grandfather worked for Kodak for 30 years and he was able to travel all over Europe and Asia and he has brought back some amazing stories with him. The temptation of travel alone would get me to apply at Kodak. Although I like what Kodak has to offer, the company’s recent struggles make me nervous. In the last year they have been forced to lay-off thousands of employees and I do not know if the company has stabilized from that. It would make me nervous to work for a company who was still struggling with their net income. I would be afraid that if they did hire me that a few months down the road if there were problems within the company that the new girl would be the first to go.